The 100th orbital launch of 2018, Roscosmos’ Soyuz MS-11 lofted three international crewmembers from the United States, Canada, and Russia to the International Space Station via a 6-hour orbital rendezvous flight. Launch occurred at 06:31 EST (1131 UTC) on Monday, 3 December 2018 – which was 17:31 local time at the Baikonur Cosmodrome launch site in Kazakhstan. 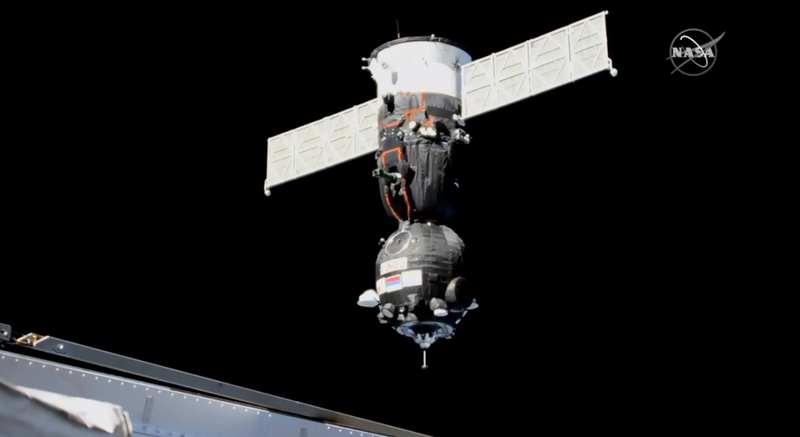 Docking to the ISS followed at 12:33 EST (1733 UTC). Less than two months after Soyuz MS-10 performed an in-flight abort to safely remove its two person crew from the top of their failing Soyuz-FG rocket, Roscosmos resumed crew flight transportation up to the Station. The Soyuz MS-11 mission had originally been targeting a launch on 20 December 2018 to take three new crewmembers up to the ISS to join the two-person Soyuz MS-10 crew – bringing the Station’s total complement to five. The targeted 20 December launch would have taken place roughly one week after three Station crewmembers landed in their Soyuz MS-09 spacecraft. However, those plans were thrown into confusion on 11 October 2018 when the Soyuz MS-10 launch failed at rocket booster separation just over 2 minutes into flight. During the abort, Soyuz MS-10’s payload fairing thrusters fired upon immediate detection of the failure of the Soyuz-FG rocket and pulled the MS-10 crew vehicle quickly and safely away from the booster. With the MS-10 crew safely returned to Earth, Roscosmos began an immediate investigation – returning an official finding three weeks later that the ball joint connector linking a side booster to the second stage was deformed during assembly and therefore prevented proper separation of the side booster. With that understanding in hand and no material changes required to the Soyuz-FG rocket, Roscosmos, NASA, the Canadian Space Agency, and the International Space Station Program began a review of timelines for the on-orbit Soyuz MS-09 and the next-in-line-to-launch Soyuz MS-11 crew vehicles. According to NASA in an MS-10 post-abort news conference, Soyuz MS-09 would have to return to Earth by early January 2019 based on orbital lifetime certification limits – though publicly available information on Soyuz’s on-orbit lifetime seemed to indicate a late-December return would be necessary to ensure a “within lifetime” reentry and landing of Soyuz MS-09. Complicating this was the fact that Soyuz MS-10’s launch failure left the ISS with a significantly reduced crew of just three astronauts. Traditionally, ISS crew rotations occur with “indirect handoffs” – where one three-person crew subset lands and their three replacements launch about a week later – the original plan for the handoff between the MS-09 and MS-11 crews. With the Soyuz MS-10 failure, however, that planned indirect handoff between the MS-09 and MS-11 crews became unfeasible because it would mean decrewing the International Space Station – something the international partners wish to avoid if possible. Given the date by which Soyuz MS-09 needed to land and the new need to have a direct handoff between the two crews while both were on the Station, the nearly unprecedented move was taken to advance Soyuz MS-11’s launch date by 17 days. Rocket launches almost never advance from planned No Earlier Than dates, and even in the rare cases where they do, it’s almost always on the order of one or two days. Pulling a crew launch forward by more than 2 weeks is a massive undertaking that involves acceleration of not just the crew vehicle’s and rocket’s processing timelines but also a significant advancement in mandatory crew training prior to launch. Nonetheless, NASA, Roscosmos, and the Canadian Space Agency accepted the challenge and have completed all activities without sacrificing safety. Soyuz MS-11 was the 100th orbital launch of 2018. The last time the worldwide orbital launch total reached 100 in a single year was 28 years ago in 1990. Additionally, Soyuz MS-11 was the 140th launch of a Soyuz spacecraft since the very first Soyuz variant was introduced on 28 November 1966. This also marked the Soyuz-FG’s 68th launch, having flown 66 successful missions to date for a success rating of 98.5%. The Soyuz MS-11 spacecraft (callsign “Antares”) arrived at the Baikonur Cosmodrome launch site in Kazakhstan on 30 August 2018 for receiving inspections and final pre-launch processing. By the end of October, Soyuz MS-11’s launch was officially brought forward 17 days to 3 December, and all processing and training schedules were realigned accordingly. The three-person Soyuz MS-11 crew and their backups completed all necessary Soyuz-specific testing and exams on 15 November. Five days later, they traveled to the Baikonur Cosmodrome for the start of final pre-flight training. The same day, engineers and management held a formal review of Soyuz MS-11’s processing and cleared the vehicle for propellant and compressed gas fueling. Meanwhile, the crew participated in fit checks and inspections of the Soyuz MS-11 spacecraft – including safety training and launch/entry suit checkouts. Additional training included manual flight/proximity flying of Soyuz with the Space Station, a detailed review of all Soyuz flight hardware, and testing of ballistic flight operations in case of emergency. 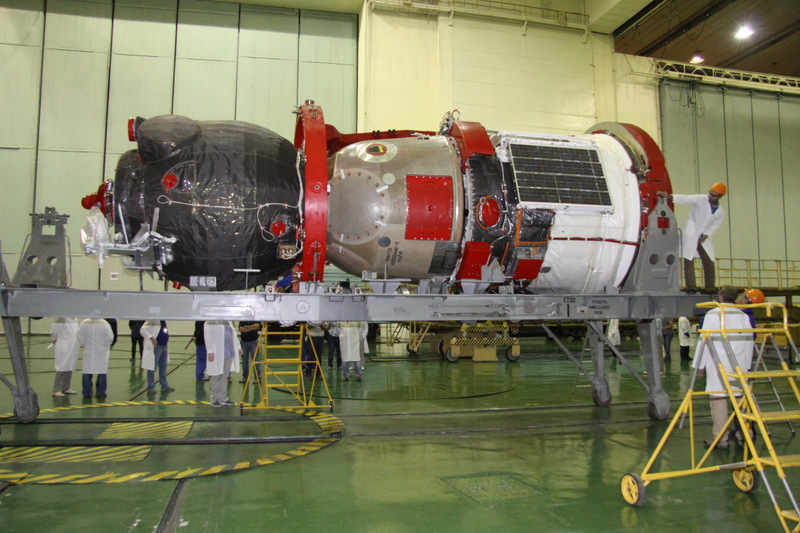 After Soyuz MS-11 was fueled, the craft was taken to the Assembly and Testing Facility where final pre-launch preparation began – including mating Soyuz MS-11 to its adaptor that will physically connect it to and separate it from the Soyuz-FG rocket and encapsulating the craft inside its payload fairing. On 27 November, engineers performed the Designer’s Inspection and cleared Soyuz MS-11 for transportation to the integration facility and for mating with the rocket – essentially clearing the Soyuz spacecraft itself for launch. The MS-11 crew completed final inspection of their spaceship on 29 November and familiarized themselves with the location of all flight hardware and payloads. That same day, the crew also inspected the Soyuz-FG rocket. On 30 November, Soyuz MS-11 was transported to the integration facility and mated to its launch abort tower before the entire craft was then mated to the top of the third stage of the Soyuz-FG rocket. The fully integrated Soyuz MS-11 launcher and spacecraft were transported to Site No. 1/5 at Baikonur on 1 December 2018 and erected vertical on the launch pad in preparation for liftoff. Soyuz-FG rocket launched from Baikonur Cosmodrome at 06:31 EST (1131 UTC) on Monday, 3 December 2018 to begin a four orbit, 6-hour orbital rendezvous with the International Space Station. At the time of launch, the Station was roughly 650 km east-northeast of the launch site. The Soyuz-FG rocket thrusted the MS-11 spacecraft through an 8 minute 45 second ascent, delivering Soyuz into a roughly 240 x 200 km orbit inclined 51.6° to the equator. Almost immediately after third stage shutdown, Soyuz MS-11 separated from its adaptor and deployed its solar arrays and communication antennas. Within minutes, Soyuz MS-11 transmitted its orbit parameters down to the Vostochny Cosmodrome in eastern Russia – data that were immediately transferred to engineers at Mission Control Moscow (MCC-M). 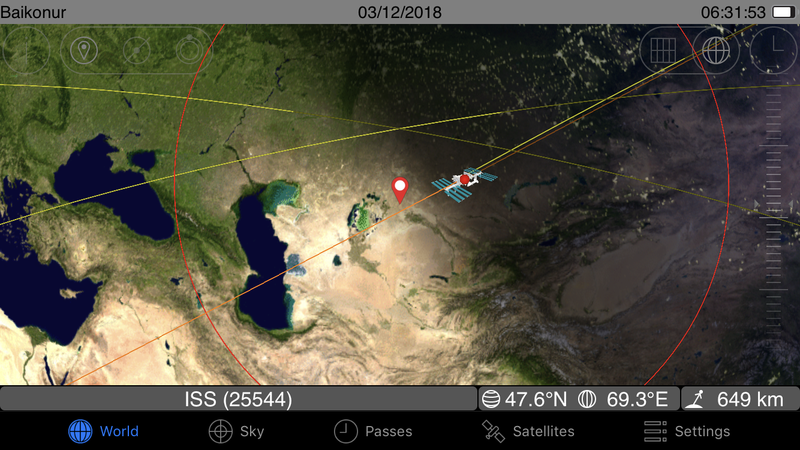 Fast-track rendezvous profiles of Russian vehicles with the International Space Station involves instant validation of orbit insertion data to make certain the vehicle has been delivered to its correct orbit with little error. With Soyuz MS-11 inserted into a near-perfect orbit, MCC-M gave a “go” to proceed with the fast-track rendezvous. 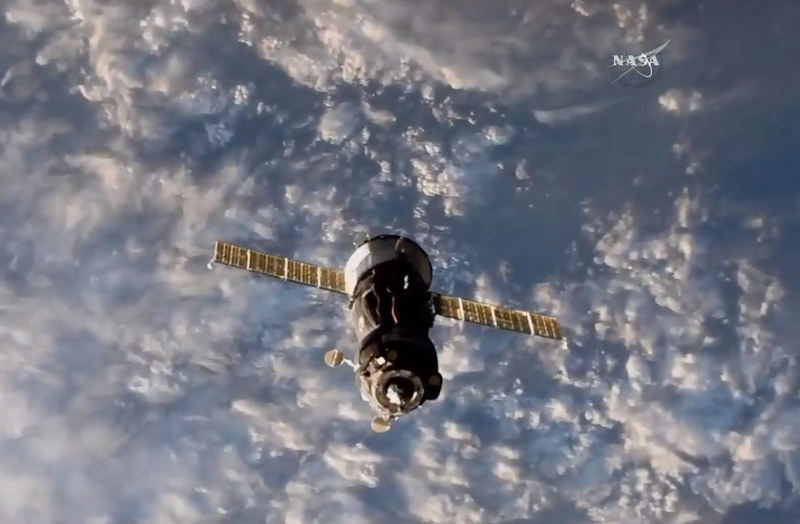 Had the orbit not been perfect and could not be quickly be corrected, Soyuz MS-11 would have reverted to a 36 orbit, 2-day orbital rendezvous. 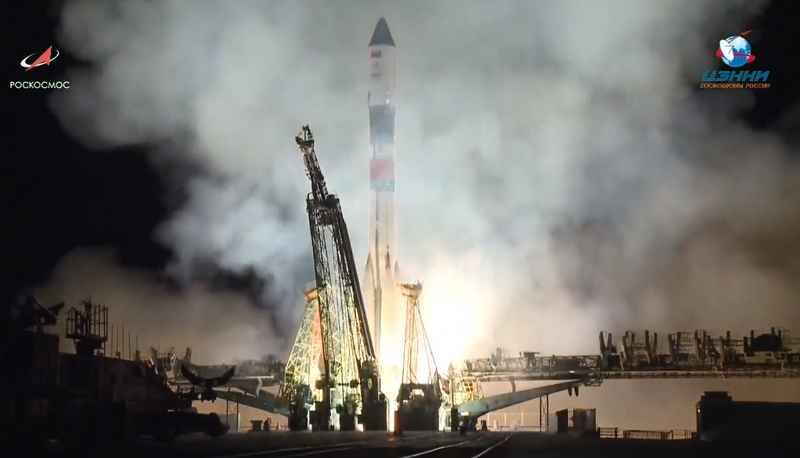 Per the mission plan, Soyuz MS-11 with its three person crew approached the International Space Station and performed an automated docking to the laboratory at 12:33 EST (1733 UTC) – just 6 hours after launch – while the two vehicles tracked northeast across the North Atlantic Ocean. 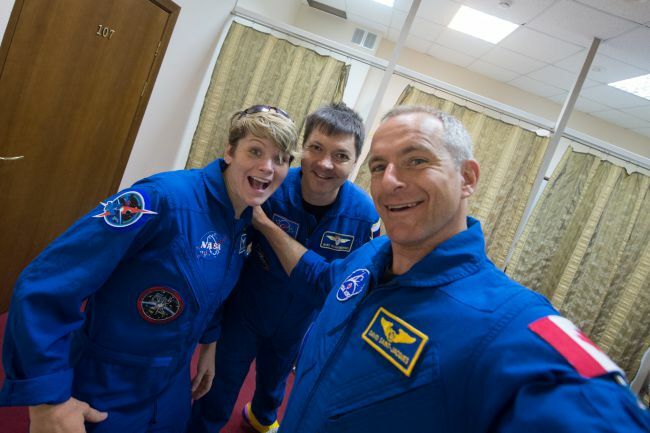 The Soyuz MS-11 crew consists of one veteran cosmonaut, Oleg Kononenko (Roscosmos), and two first-time astronauts, David Saint-Jacques (CSA) and Anne McClain (NASA). Upon docking with the International Space Station, the trio joined the in-progress Expedition 57 increment, performing direct handover operations with the Station’s current crew. 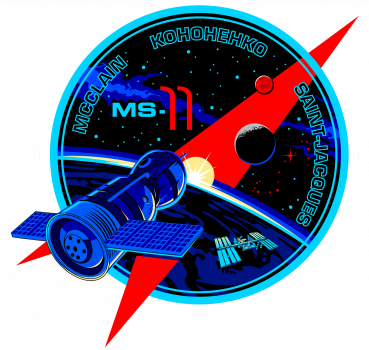 On 20 December, after 17 days in space, Kononenko, Saint-Jacques, and McClain will transfer to Expedition 58 upon the undocking of the Soyuz MS-09 spacecraft. Oleg Dmitriyevich Kononenko was born 21 June 1964 in Chardzhou, Turkmen Soviet Socialist Republic, and is a veteran of three previous long-duration missions to the Space Station. Kononenko graduated from the N.E. Zhukovskiy Kharkiv Aviation Institute in 1988 as a mechanical engineer and worked for Roscosmos-controlled Central Specialized Design Bureau in the Progress Rocket Space Centre where he worked on system design, analysis, and development of spacecraft electrical power systems. Selected as a cosmonaut candidate on 29 March 1996, Kononenko underwent two years of training at the Gagarin Cosmonaut Training Center before he began formal ISS training in October 1998. After three years, he was assigned as a backup flight engineer for Soyuz TM-34. He served in this capacity from December 2001 until April 2002 when he was re-assigned as a backup flight engineer for the prime crews of both Expeditions 9 and 11. In March 2006, Kononenko was assigned as flight engineer and prime crewmember for Expedition 17 and launched on his first spaceflight on Soyuz TMA-12 on 8 April 2008. Serving as Flight Engineer 1, Kononenko assisted with the installation and activation of the Japan Kibo laboratory delivered to the Station in June during Shuttle Discovery’s STS-124 mission. As part of Expedition 17, Kononenko performed two spacewalks, or EVAs, on 10 July and 15 July 2008. During the first EVA, he inspected the Soyuz TMA-12 spacecraft and retrieved a pyro bolt from it as part of an ongoing Roscosmos investigation into two back-to-back emergency ballistic Soyuz reentries. During the second spacewalk, Kononenko installed an experiment, retrieved another, and installed a docking target on the Zvezda service module. His first spaceflight ended on 12 October 2008 with a successful landing in Kazakhstan. A year later, he was assigned to his second long-duration ISS mission as a member of Expeditions 30 and 31. He launched as Commander of Soyuz TMA-03M on 21 December 2011. On 12 February 2012, Kononenko performed this third spacewalk to install micrometeoroid protection shields on the Zvezda service module, move the Strela 1 crane from the Pirs docking compartment to the Poisk Mini Research Module, and install the Vynoslivost experiment on Poisk. On 27 April 2012, Kononenko took over as Commander of the ISS for Expedition 31, during which time he oversaw the arrival of the first commercial spacecraft to ever rendezvous with the ISS when SpaceX’s Dragon cargo craft approached and was grappled and berthed to Station on 25 May 2012. Kononenko completed his second spaceflight with a landing in Kazakhstan on 1 July 2012. One year later, he was assigned as a prime crewmember to his third long-duration ISS mission. Launched on 22 July 2015, Kononenko again served as Commander of the Soyuz TMA-17M and as a Flight Engineer for both Expeditions 44 and 45. 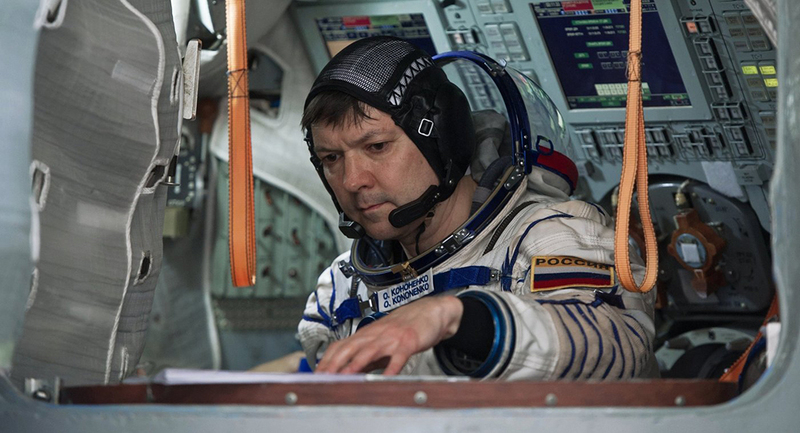 At the conclusion of Expedition 45, Kononenko returned to Earth in a rare night landing of the Soyuz spacecraft – bringing his total time in space to an impressive 1 year 168 days 3 hours 28 minutes. 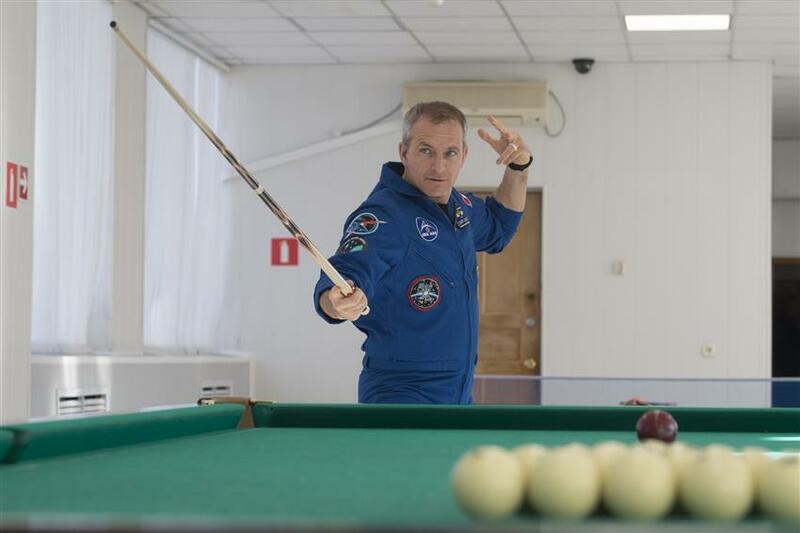 David Saint-Jacques was born 6 January 1970 in Quebec City, Canada. He holds an impressive array of degrees, including a bachelor of engineering in engineering physics from École polytechnique de Montréal in 1993 and a Ph.D. in astrophysics from Cambridge University, UK, in 1998. Saint-Jacques began his career as a biomedical engineer, working on the design of radiological equipment for angiography at Lariboisière Hospital in Paris, France. During his graduate studies in astrophysics, he developed adaptive optics and interferometry systems for the Cambridge Optical Aperture Synthesis Telescope and the William Hershel Telescope in the Canary Islands. His postdoctoral astrophysics research included development of the Mitaka infrared interferometer array in Japan and the Subaru telescope adaptive optics system in Hawaii, after which he joined the Astrophysics group at Université de Montréal. Not to be stopped with just a doctorate in astrophysics, Saint-Jacques entered medical school and obtained his Medical Doctorate from Université Laval in Quebec City in 2005. Following medical school, he completed a residency in family medicine at McGill University in Montreal with a focus on first-line, isolated medical practice in 2007 before serving as a medical doctor and Co-chief of Medicine at Inuulitsivik Health Centre in Puvirnituq, Nunavik, an Inuit community on Hudson Bay. Saint-Jacques was selected in May 2009 by the Canadian Space Agency as an astronaut candidate and transferred to Houston, Texas, and the Johnson Space Center as one of 14 members of the 20th NASA astronaut class. 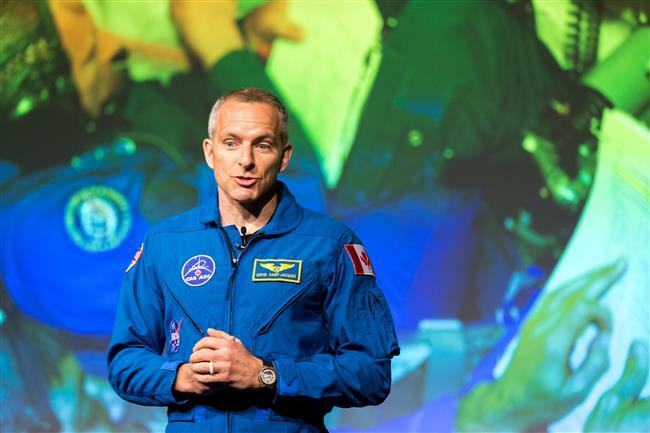 He graduated from Astronaut Candidate Training in 2011 and has since taken part in various geology, glaciology, speleology and other scientific expeditions. From 20-26 October 2011, he was a member of the NEEMO 15 underwater mission for NASA off the southern coast of Florida. He was also part of the CAVES (Cooperative Adventure for Valuing and Exercising Human Behaviour and Performance Skills) 2013 mission to train astronauts to work together during a one week underground expedition. Saint-Jacques has also completed assignments in the Robotics Branch of NASA’s Astronaut Office, successfully serving as a Support Astronaut for Expedition 35/36, Lead Capsule Communicator (Capcom) for Expedition 38, Deputy Capcom for the first two Cygnus resupply missions, and Lead Capcom for the third and fourth Cygnus missions as well as for SpaceX CRS-6. He recently served as a Capcom instructor and supported Visiting Vehicle Operations in the ISS Integration Branch. In May 2016, Saint-Jacques was assigned to his first spaceflight as a long-duration member of Expedition 58. He began training in August 2016. 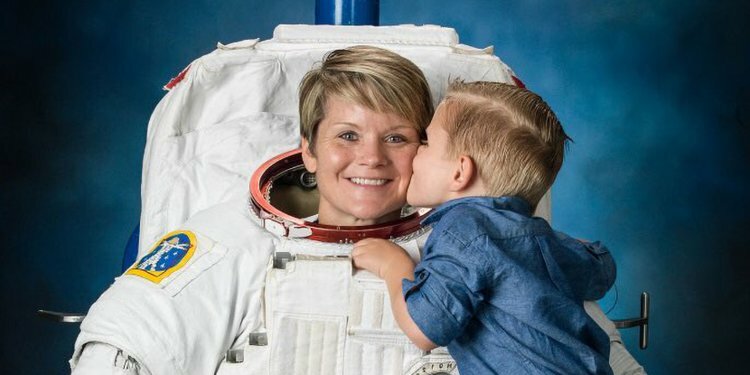 Anne Charlotte McClain is a 39 year old Lieutenant Colonel in the U.S. Air Force who will make her first flight to space aboard Soyuz MS-11. Born 7 June 1979 in Spokane, Washington, McClain earned a Bachelor of Science in Mechanical/Aeronautical Engineering from the U.S. Military Academy at West Point in 2002 and was immediately commissioned as an Army officer thereafter. Upon commissioning, she was a 2002 Marshall Scholar and earned a Master of Science degree in Aerospace Engineering from the University of Bath in Bath, England in 2004, and a Master of Science in International Relations from the University of Bristol in Bristol, England in 2005. Her Master of Science in Aerospace Engineering focused on the unsteady aerodynamics and flow visualization of free-to-roll nonslender delta wings. Her research was published through the American Institute of Aeronautics and Astronautics (AIAA). At the same time, she researched the security burden in developing countries. Upon completion of both Master degrees, McClain earned her wings as an OH-58D Kiowa Warrior scout/attack helicopter pilot and was assigned to the 2nd Battalion, 6th Cavalry Regiment at Wheeler Army Airfield, Hawaii, as an Air Traffic Control Platoon Leader, Aviation Intermediate Maintenance Platoon Leader, then later as Detachment Commander. She served 15 months in Operation Iraqi Freedom, flying more than 800 combat hours on 216 combat missions as pilot-in-command and Air Mission Commander. In 2009, she attended the Aviation Captain’s Career Course and was subsequently assigned to the 1st Battalion, 14th Aviation Regiment at Fort Rucker as the battalion operations officer and OH-58D instructor. She completed Command and General Staff College and the C-12 fixed wing multi-engine qualification courses in 2011 and 2012 before then attending the U.S. Naval Test Pilot School where she graduated in June 2013. The same month, McClain was selected by NASA as an astronaut candidate and reported to the Johnson Space Center for two years of astronaut training.